(Nanowerk News) Commercial devices capable of encrypting information in unbreakable codes exist today, thanks to recent quantum optics advances, especially the generation of photon pairs—tiny entangled particles of light. Now, an international team of researchers led by professor Roberto Morandotti of INRS-EMT in Canada, is introducing a new method to achieve a different type of photon pair source that fits into the tiny space of a computer chip. 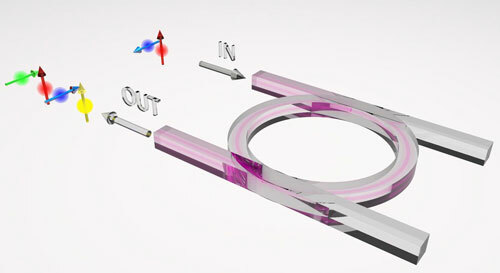 The team's method, which generates "mixed up" photon pairs from devices that are less than one square millimeter in area, could form the core of the next-generation of quantum optical communication and computing technology. The research will be presented at The Optical Society's (OSA) 98th Annual Meeting, Frontiers in Optics, being held Oct. 19-23 in Tucson, Arizona, USA. One of the properties of light exploited within quantum optics is "photon polarization," which is essentially the direction in which the electric field associated with the photon oscillates. The research team set out to find a way to directly "mix up," or cross-polarize, the photons via a nonlinear optical process on a chip. "While several efforts have been devoted to develop on-chip sources of polarization-entangled photons, the process typically used to generate these photons only allows the generation of photons with the same polarization as the laser beam used to pump the device — either both horizontal or vertical — after which entanglement can be achieved by accurately mixing these states. Now, we have found a way to directly generate cross-polarized photon pairs," says Lucia Caspani, a postdoctoral fellow at INRS-EMT and co-author of the Frontiers in Optics paper. To generate the cross-polarized photons, Caspani and colleagues used two different laser beams at different wavelengths —one vertically polarized and another horizontally polarized. The approach, however, came with a potential pitfall: the classical process between the two pump beams could destroy the photons' fragile quantum state. "Our approach opens the door to directly mixing different polarizations on a chip," Caspani points out. "At very low power, our device directly generates photon pairs with orthogonal polarizations, which can be exploited for quantum communication and computing protocols." The fabrication process of the chip is also compatible with that currently used for electronic chips. "It enables a future coexistence of our device with standard integrated circuits," says Caspani, which is a fundamental requirement for the widespread adoption of optical quantum technologies. Presentation FTu2A.2, "Direct Generation of Orthogonally Polarized Photon Pairs via Spontaneous Non-Degenerate FWM on a Chip," takes place Tuesday, Oct. 21 at 11 a.m. MST at the Arizona Ballroom, Salon 8 at the JW Marriott Tucson Starr Pass Resort in Tucson.